How to improve solar charging PC efficiency for consumer devices. Last Thursday I spent a lot of time analyzing exactly how efficient my charging solution was with a real-life test. What dropped out was a rather poor picture of how inefficient the whole solar charging setup was. From over 1.2KW hitting the area of my solar panel I managed to use about 19W. That’s a 1.5% efficiency rate and its amazing that I was able to do anything with it! Take a look at the diagram again below. it shows the loss-points along the route from the sun to the UMPC. Of course! Any improvement in efficiency here would help. Currently a good average is around 9W and if this could be reduced to 6W average, it would be a major improvement. From 1.2KW that hit the panel, only 660W hits the solar cells and those cells are only around 8% efficient and this is the first place we can look for improvements. Current top-end production solar panels are 22% efficient but these are hard panels. To get the equivalent of 25W power you would need a hard panel of about 35x35cm plus frame. Lets say 40cmx40cm in total area. By using a hard panel of this size I could have actually put one on the front and one on the back of the bike to achieve a much more powerful solution. Finding a 40x40cm high efficiency panel might have been difficult though and probably less rugged. There could be a weight consideration too. Given the space restrictions on a bike, I think that a hard panel solution might have been better. In the campsite it wouldn’t have made much difference. The foldable panel was light and small and there should be no need for more than 25W of max power. Battery tech and charging methods. There’s a lot that needs to be improved here and the improvements can be achieved through a combination of process and of technology. What follows are the most important issues. The lead-acid battery proved to be a hindrance more than a help. It was heavy. It had no charge level indication and at low charge levels it couldn’t deliver enough current to drive my DC DC converter or even charge the AA batteries. In short, I didn’t use it much at all and I would drop it from my kit list if I did it again. I knew that charging a battery just to have it charge another battery would be inefficient but I didn’t realize that it could be so bad. For example, the Li-Ion battery pack I have (Tekkeon/Tablet Kiosk MP3400) appears to lose about 25% energy through the input and Li-Ion charging stage. That is, you have to pump something like 20% more energy into it than it can store. But that’s not the whole story. The voltage conversion process on the output stage kills another 20% of the energy! From input to output you’re losing a shocking 40% or more energy! But there’s another problem too and i’ve mentioned it before. The charging of Li-Ion batteries occurs at a fixed rate which means however much energy you have available and however quickly you could feed it into a Li-Ion battery, it won’t take it any quicker than its designed for. The MP3400 takes about 15W (about 0.8A at 19V) of energy to charge it and even if I attached a panel capable of delivering 50W, it would still only take 15W wasting a huge amount of available energy. 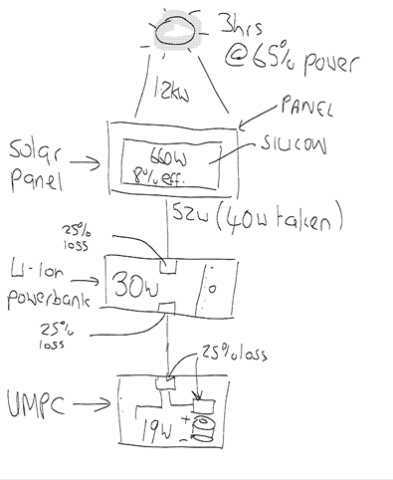 This last problem is the one that needs attention when designing a solar charging solution. I have detailed some possible solutions at the end of this article. Direct charging UMPCs from solar. One thing that I found annoying was that the only was I could charge my UMPC battery safely was to charge it from the Li-Ion battery. Obviously this is inefficient for the reasons mentioned above but why can’t I charge the UMPC direct from the solar panel? The main problem is that the DC input circuitry on the UMPC is an unknown factor. There’s no way to tell if there is over-voltage protection or whether it will charge a through varying input voltages and its just too much of a risk to try it out. When the DC input on the UMPC is broken, so is the UMPC! I also though about trying to charge the UMPC battery on its own but there’s no standard in connectors or charging currents and voltages so unless you want to build your own charging circuit, this isn’t possible (with the one exception of the OQO Model 02 that has an external battery charger.) I don’t really see this changing much on UMPCs in the near future though. There’s no real reason to increase the complexity of the DC circuit just because Chippy and a few others wish to use solar panels!! The Sunlinq 25w panel and Tekkeon MP2400 battery pack is an easy option, readily available and relatively cheap. It works, and if you use the tips above, it can be quite succesful but there are further improvements that could be made, especially if you have the time a flexibility to adjust your solution as you go. Lets assume the lead-acid battery option is too heavy and will not be used. Ideally you will have the flexibility to add load and add solar capacity as conditions vary. This requires multiple smaller solar panels and multiple smaller Li-Ion batteries that can be set up in different situations. This is currently the only way to provide the most efficient charging solution. Buy multiple slow-charging (500mA for example) Li-Ion battery packs that can be stacked in parallel as energy availability increases. You will need a voltage regulator on the output of the solar panel and this will need to match the input voltage of your charging solution. Preferably 12V. Fit an ammeter and voltmeter to the output of the voltage regulator so that you can monitor load and voltage. This all takes a lot of time and effort though and for most people its not worth the trouble. Ideally you would have a smart charger that does the monitoring and switches in Li-Ion packs as current availability increases. I have not seen such a solution yet and this, along with some more advanced solutions is what I’d like to see in the near future. How about a Li-Ion battery pack that has three levels of charging speed. Low, Med and High. These can be manually adjusted to match the energy available. Ultimately you would have a Li-Ion battery pack that self adjusts to the input current available. I have seen a few advanced components that claim to be able to do this but have never seen a consumer product that is able to do it. If you can get vari-charging Li-Ion batteries then there is really no need for the heavy lead-acid battery at all. Finally, I’d like to see more UMPCs that have an external battery charger with good, efficient circuitry, over voltage protection and a wide range DC input voltage. Currently there are very few options here. I’ll be watching this space carefully from now on and I hope that it won’t be long before I can report about new solutions to the issues of solar power and battery charging. Solar UMPC Tour photo set. DO any of this company’s solar solutions look good? Yeah. The solar panel looks to be a ‘hard’ panel and its high power. The lead acid battery is damn heavy though! Its a good general-use setup, not an ultra-mobile one though! You could build two external power supplys for the UMPC and leave the standard batteries at home. One could be in the charger and one in the UMPC. Maybe you could build it with standard NiMH AA batteries. Also, if you modify your charger, it could serve more as a voltage regulator. The more electronics you can eliminate, the lighter your load and the less solar panel area needed for a given number of hours of UMPC use. would this be a viable solution?